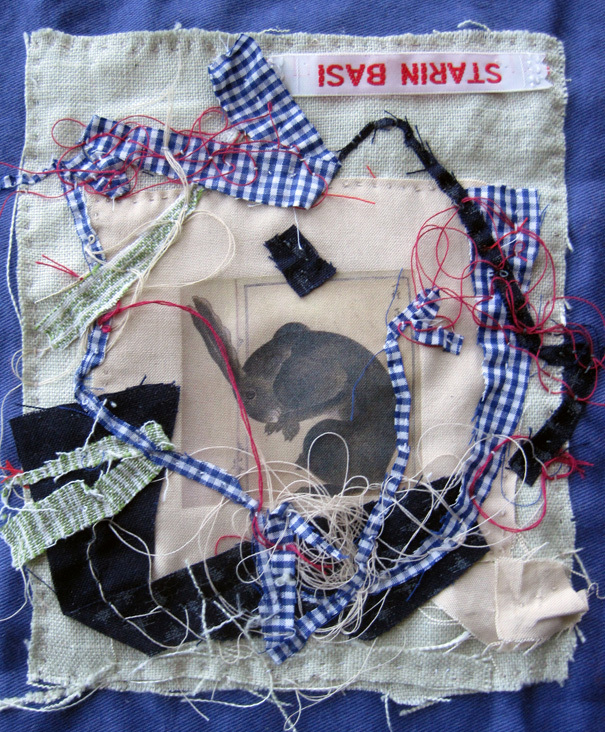 Have sewing kit, will travel — and I never, ever travel without my sewing kit. 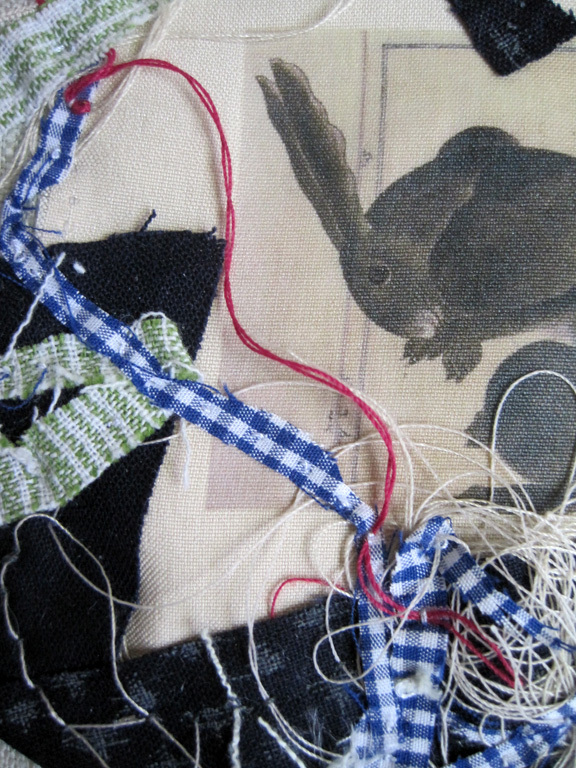 In recent years that kit has included a baggie full of assorted patches, ranging from intriguing scraps of material to photo transfers on fabric using images gleaned from a treasure trove of ancient illustrated texts from around the world. As a house guest, it is nice to be able to stitch in idle moments, repair your hosts' favorite clothing, and leave a little creative patching in your wake after you depart. 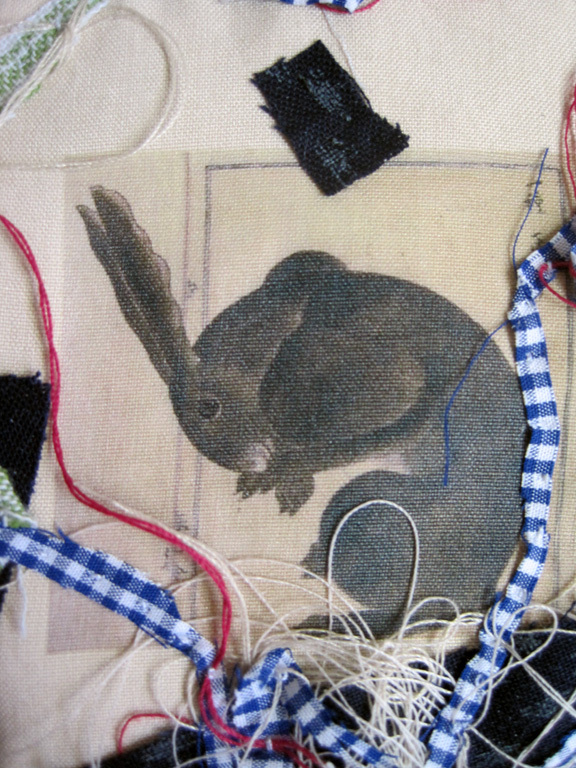 I was recently back visiting in London (see Mending Mania: London for an earlier bout of patching for the same hosts) and as I stitched away in their solarium I regularly herded stray bits of cloth and thread together for easy removal, using a random patch with an image of a rabbit on it from an old Persian textbook as a base to gather all the scraps. At one point I glanced over and saw that the rabbit now appeared to be sheltering in a very cozy nest, and promptly stitched all the random components of that nest in place, adding a lucky find I discovered while rummaging through a kitchen drawer looking for glue: an old label my hosts used to identify their children's clothing when they went away to camp in years gone by. The house in London is a lovely nest, and this was another way to thank my hosts for being kind enough to share it with me.